Published Nov. 30, 2018 at 2:01 p.m. If Ryan Wickens and Naomi Kaufman could have fit an Old Fashioned in their Wisconsin-themed bingo game called Wiscongo, they would have. But alas, laws are laws and so players of this new party game are on their own for drinks, but in two of the three versions of the game koozies are in the box. Kaufman and Wickens, a married couple living in Riverwest, created Wiscongo earlier this year. Kaufman is a native of Neenah and Wickens moved here from London to attend Cardinal Stritch University on soccer and cross country scholarships. 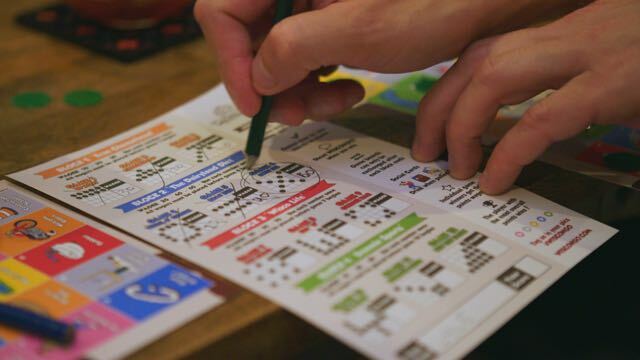 The couple owns Quizmaster Trivia, a live pub quiz business based out of Milwaukee, and says they are always exploring new ideas. "We wanted to spread our love for this great state we call home in a fun, new game," says Wickens. "We got the idea from bingo but wanted to make it more fun and appeal to a younger crowd." 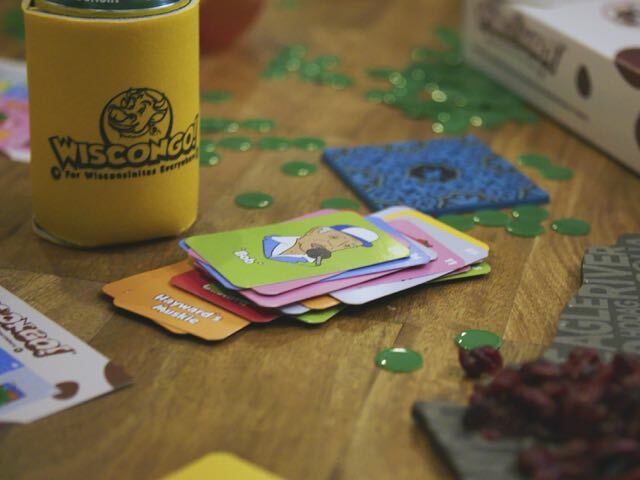 Wiscongo is a variation of the popular casino-and-church-basement version. Instead of pulling balls with numbers on them, there's a deck of cards that feature 50 Wisconsin icons. The icons range from simple stuff like "cheese curds," "Northwoods" or "loaded bloodies" to slightly more obscure things like "The Milverine," "Hodag" and "Recombobulation area." "Picking the 50 icons was a challenge because Wisconsin has so much cool and weird stuff," says Wickens. "But we wanted to encompass icons from all over the state and we feel we've represented America's Dairyland pretty damn well." The game is for 2-8 players, and involves engaging, easy and yet unorthodox rules that aren't in regular bingo. Wiscongo is available on the website or at local retailers including The Waxwing, The Cheesehead Factory Store, Milwaukee Art Museum store, Marigold Marketplace in Menomonee Falls and The Local Collective in Hartford. The game is completely Wisconsin-made, thanks to the design by local artist David Zimmerman and GraphiColor printing in New Berlin. Wickens and Kaufman assemble the game by hand in their basement. "As we say, this is not your grandma's bingo," says Wickens.